By making Windows 9, aka "Threshold," free, Microsoft will be able to push more than half of all Windows 8 users to the upgrade within a matter of months, an analysis of user share data shows. Extending the free upgrade offer to Windows 7 would have a smaller impact, primarily because nearly half of all of Windows PCs are in commercial or government settings, where upgrading is taken seriously and not left to mortals, like employees. But even with Windows 7, Microsoft could expect to convince a sizable minority to make a quick switch to Windows 9. Last month, 53% of PCs running Windows 8.1 or Windows 8 ran the former, an increase of about 13 percentage points from six months prior. Over the last 12 months, the no-cost Windows 8.1's share of the combined user share of it and Windows 8 was 8.5 times Windows 8's share of it and Windows 7 at the same point in Windows 8's post-launch timeline. Although the uptake of Windows 8.1 was front-loaded, even in August its share was 3.7 times that of Windows 8 at identical points in their lifecycles. More importantly, it took Windows 8.1 only seven months to break the 50% mark: By May, Windows 8.1 accounted for half of the combined user share of it and Windows 8. While that was more than three times what it took Apple's OS X Mavericks to reach 50% of the aggregate share of it and its Mountain Lion and Lion predecessors, Windows 8.1's uptake was unprecedented for a Microsoft operating system. Windows 8.1 (blue) reached the 50% mark -- the user share of it and its predecessor, Windows 8 -- in just seven months. OS X Mavericks (red) reach the same milestone in just two months. 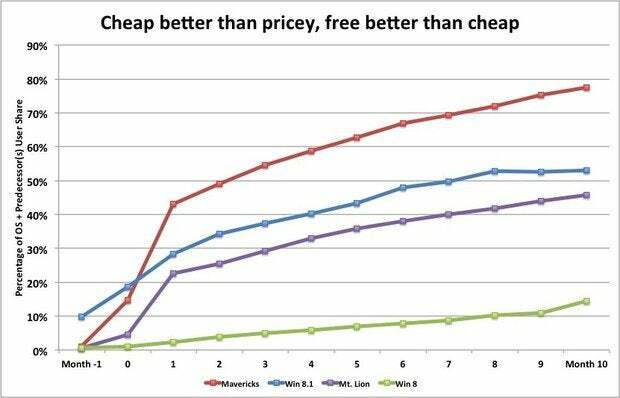 As Computerworld reported in March, "cheap is better than pricey, free is better than cheap" when it comes to personal computer operating systems. With Windows 8.1 as a guide, Microsoft should have no trouble matching that cadence with Windows 9, the assumed name for what has gone by "Threshold" as a code name. In other words, if Microsoft launched Windows 9 in April or May 2015, it should be able to get at least half of all Windows 8 and 8.1 PCs (as of April) onto the new OS by the end of the year. Figuring Windows 7's migration to Windows 9, assuming Microsoft extends the free upgrade to the former pool of PCs too, is trickier. Research firm IDC says that of the installed base of Windows PCs, approximately 55% are in the hands of consumers, 45% in commercial organizations. If that ratio applies to Windows 7 -- which accounted for 56% of all Windows PCs last month -- that means consumers' systems represent about 31% of all Windows-powered machines. Commercial PCs would be discarded from the calculations: Businesses simply don't upgrade at the same pace as consumers. Even though they may be interested in Windows 9, they probably won't begin upgrading until 2018 at the earliest, according to Gartner, and so are off the table. And it would be foolish to assume Windows 7 PCs, even those owned by consumers, would upgrade to Windows 9 at the same rate as those running Windows 8/8.1. For one thing, Windows 7 runs on nearly four times as many systems as does the newer OSes. But even a "discounted" percentage that does upgrade within the same time frame would be an enormous number of machines. If, say, consumer Windows 7 PCs were upgraded to Windows 9 at only half the rate of Windows 8/8.1 systems, and the upgrades begin in April when Windows 7 should account for 59.8% of all Windows systems, it would drag 8.2% of all Windows machines onto the new operating system within seven months (59.8% X 55% for consumers' part of the total X 25% upgrade rate). Combine that with the 9.4% of all PCs running Windows 8/8.1 in April 2015 -- by then, the OSes share should have climbed to just under 19% of all Windows machines -- and Windows 9 would be on a total of 17.6% of all Windows PCs. 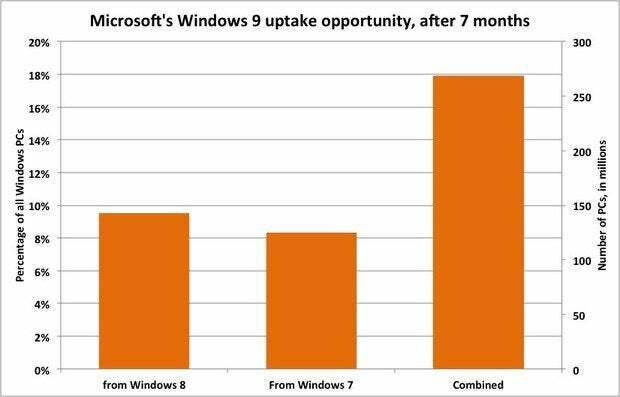 While that isn't dramatically higher than the uptake tempo of Windows 7 -- that OS was on 13.9% of all Windows PCs seven months after its October 2009 debut -- it would be more than three times the share that Windows 8 managed to grab in its initial seven months. And it would be a speed record for a major-version-to-major-version upgrade. But what's in it for Microsoft? Typically, corporations don't change practices out of a sudden sense of largess; instead, there must be solid business reasons. Like putting Windows on equal footing with other OSes: Users have been trained to expect free operating system upgrades on their smartphones and tablets, and with Apple's move last year to give away OS X upgrades, those on Macs as well. Windows is the holdout. Getting with the program becomes important if Microsoft ever hopes to have a shot in tablets, whose makers have passed on the touch-only Windows RT for the full Windows instead. As Microsoft's OEM (original equipment manufacturer) partners push into the lowest price bands -- at the IFA tradeshow this week, Toshiba unveiled a 7-in. tablet expected to sell for less than $100 -- free upgrades from Windows 8.1 will be necessary. No one will spend more than the tablet, or even a fraction of the price, to upgrade the OS. Without a free upgrade, fragmentation ensues, the problem Google's Android still wrestles with. The same goes for Microsoft's efforts to combat Chromebooks, the dirt-cheap laptops that have made inroads into the portable market, particularly in education and government. Microsoft seems especially sensitive to Chromebooks' encroachment. The give-away would also be a boon to developers, both in-house and third-party, who could then focus more on the latest rather than supporting the older editions. Apple, for instance, clearly set the stage for OS X Yosemite, the 10.10 version slated for launch next month, with the free OS X Mavericks last year: Without the latter's explosive uptake -- 64% last month -- Apple would have been unable to assume a large pool of potential upgraders for Yosemite. In turn, that would have dampened the likely opening impact of new Yosemite features, especially "Continuity," the umbrella term for several tools, notably "Handoff," where iOS 8- and Yosemite-powered devices, using proximity awareness, will be able to hand off in-progress tasks, like a half-finished document or email, phone calls, and text messaging from one to the other. With a larger, earlier installed base of Windows 9, Microsoft can pitch developers on the new OS, and back that up with numbers. More importantly, analysts believe that all of Microsoft's "go low" moves -- which include giving Windows away to OEMs building devices 9-in. and smaller, and the probably zero-or-near-zero-priced Windows with Bing -- are part of a strategy to get the OS on as many devices as possible so it can shift revenue generation from licensing to services. The latter range from Bing (advertising) and OneDrive (premium charges) to Office 365 (subscription fees). And psychologically, anything Microsoft can do to replicate the uptake tempo of Windows 7, rather than the sluggishness of its follower -- which lately fell below the mark set by the Windows Vista failure -- would be valuable. Microsoft desperately needs a hit with Windows 9 to, if nothing else, wash the memory of Windows 8 from customers' minds. If free is good, and by the successful test run with Windows 8.1 it is, then Microsoft would be smart to start thinking of zero as a friend, not an enemy, to the bottom line. Microsoft should be able to put Windows 9 on almost 18% of all Windows PCs -- which would represent about 268 million machines -- in just seven months if it gave away the upgrade.